TAliban means in Arabic students in plural – the TalibaN was one of many insurgency groups against the Russian Soviets in Afghanistan in the 80ies. The TalibaN recruited its personnel from the Pashtun Madrassas (Religious Islamic schools) in Pakistan whether the students were from Pakistan, Afghanistan or other counties in Central Asia. As all other insurgency groups the TalibaN were supported by ISI during the Afghan war. 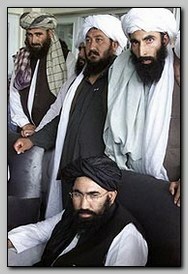 The TalibaN are led by Mullah Omar – (the title Mullah means Islamic preacher). The TalibaN practices a very strict version of Islam. After the Soviets left Afghanistan in 1989 the country plunged to civil war between the insurgence factions about the share of power over the country. The deferent factions were, generally, from deferent ethnic or religious groups, Shiites pro Iranian in West Afghanistan, Uzbek and Tajikistanis in the North and other ethnic groups all over the country. After Russians left Afghanistan in 1989 USA and CIA abandoned their interest in the area and the infrastructure was left to be used by ISI. ISI, quite naturally, wanted to exploit and carry on the Muslim enthusiasm and the network of recruiting young Muslim to Afghanistan for their war in Kashmir. As Pashtun are a very large minority in Pakistan, living on the border with Afghanistan, it was a natural choice to support TalibaN against all other ethnic groups in Afghanistan. With ISI support, by the end of 1998, TalibaN gained control on 85% of Afghanistan except a Shiite strip near the Iranian border, in the West, and another territory in the North near the borders with Uzbekistan and Tadzhikistan – the “Northern Alliance” territory. The TalibaN implemented in the country a very harsh Islamic law and butchered their enemies like the Shiite in the West or the Hazaras, a religious sect, in the area of Mazar a Sharif in 1998. The Taliban and the training camps in Afghanistan became the backyard of ISI to recruit and train in warfare thousands of Muslims for the conflict in Kashmir. The TalibaN also enabled Osama Bin Laden, who supported the TalibaN with money, to open training camps for Al Qaeda. Afghanistan became the Safe Haven for Islamic terror and Global Jihad. After The 9/11 in 11/2001 USA used the “ Northern Alliance ” to overthrow the TalibaN regime in Afghanistan (operation “Absolute Justice”) and to establish there a so called democratic system. Today (05/2007) Afghanistan is again in war against foreign powers in their country and the insurgency and TalibaN gains more and more influence.